Si, He's Back and Bloggin' Mamas has him. 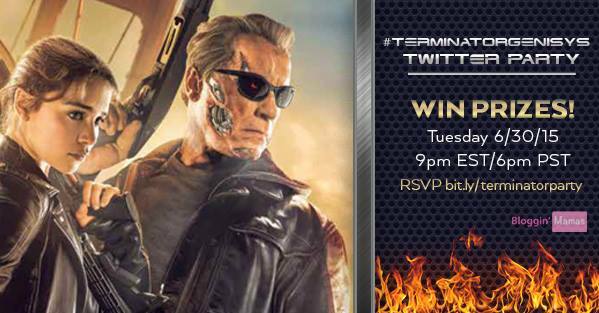 Join Blog­gin Mamas & the @Terminator as we host the #Ter­mi­na­tor­Genisys Twit­ter Party on Tues, 6/30/15 at 9p EST! Join us as we cel­e­brate the new film & talk about the Ter­mi­na­tor franchise. Dur­ing the Twit­ter Party there will be a chance to win one of the fol­low­ing prizes by answer­ing var­i­ous Ter­mi­na­tor Trivia. Win­ners will be selected at ran­dom from all eli­gi­ble entries. Ordering my Dr. Scholl's right after posting esto! Nos Vemos Alli- See Y'all there!! Disclosure: This is part of a sponsored collaboration with Bloggin’ Mamas. However, all opinions expressed are my own, including thoughts in tweets. I am receiving compensation as a co-host for the Terminator Genisys Twitter Party. The sponsor will be responsible for prize fulfillment. This giveaway is in no way associated with, sponsored, administered, or endorsed by Facebook, Twitter, Google, Pinterest or any other social media network. The disclosure is done in accordance with the Federal Trade Commission 10 CFR, Part 255 Guides Concerning the use of Endorsements and Testimonials in Advertising.